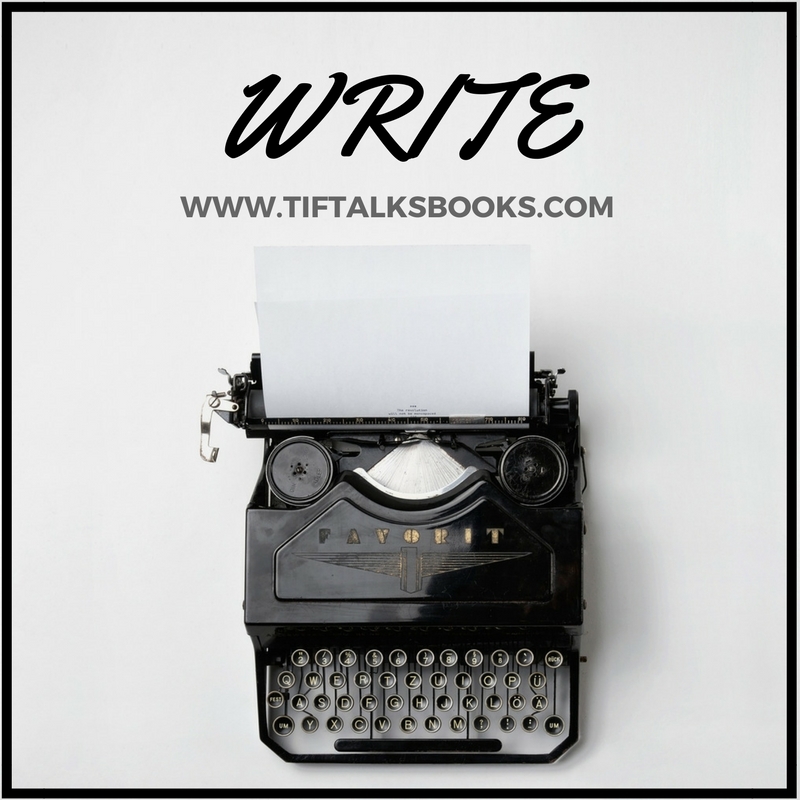 TIF TALKS BOOKS: #ONEWORD 2017: Going Practical! Every new year, I like to set goals for myself, something for myself to work on throughout the year. The last four years, I have gone big with one little word: Reflect (2016), Persevere (2015), Resolution (2014), and Discover (2013). Each of those one little words packed a real punch, and I had large goals that were associated with each one of them. A couple of those years, I felt that I was successful. In others, not so much. As for the most recent one, reflection, I honestly could not even tell you what the goal was. I forgot about it with all that occurred this last year, and I really lost sight of the big picture. And, that is why I am changing things up this year. In 2017, I have decided to go big with a smaller, more practical word: WRITE! I know that this sounds a bit crazy to just have the goal of writing for the year, but I believe this could really branch out and effect so many other aspects of my life. Because . . . When I write ... it's cathartic. I am better able to process everything around me. I am able to vent and heal. It's a release for me in so many different ways, which in turn puts me in a better mental state for my family and my work. When I write ... it's developing. The more I write, the better writer I become. I have been writing in one form or another most of my life. It started out as a hobby offline and turned into a hobby online where I met a ton of great like-minded friends. From there, it even took me into the realm of freelance writing, and I now find myself attempting to write a novel. I love growing in my writing, and because of it, growing as an individual. When I write ... it's reflective. Journaling has proven to set down memories in stone, sometimes memories that I thought were lost, or the past that would have been lost if not recorded. I love those stories, the real stories of real people, whether it is my own or someone close to me. I like to look back on those memories and feelings of the past, and I want to continue to do so in a more thorough way. When I write ... it's fun. I find that I have so many thoughts and images and what if's running through my head, and it allows me time to explore both realistic and fictional worlds. For all of those reasons above, my goal for the year is to write as much as I can. This may be every day during some weeks or 3-4 times in other weeks, but the point is to get back in the habit of writing on a regular basis. The writing may consist of journaling, blogging, or any other form of writing, from getting back into the freelance world to writing a short story or two or working on my novel. In addition, I hope to share that progress right here on the blog to check in on my progress because this year I need to hold myself more accountable. As of today, I can tell you that I have been making writing a priority in this new year, and I have already been developing that habit. Sometimes, my writing consists of 15 minutes here and there. Other times, I get to sit down and write for longer. I am starting small, and hope to build on my writing time every day until the end of the year. WRITE. It's seems simple and practical enough, but as I wrap up my thoughts on my one word goal for the year, I feel that it packs a punch just like all of my past year's words. However, it also feels like something that I can more efficiently measure, and I hope is much more tangible by the end of the year. And, I can't wait to see what that year will look like! What are your goals for the year? Do you choose one word to live by or do you do something different? Congrats on finding your word. I believe I've found mine but I am still batting it around a bit before I post about it. Ti ... I will be watching out for it. I'm curious to see what your word will be! A friend and I always name our years something too. It's not really based on a goal though. Nothing inspiring anyway, (2013 was the year of apathy) but fun none the less. I hope you write every single day. You're quite good at it, you know. I'd love to see a book you wrote published but would be happy with more blogging posts too. Kristen M. ... LOL!! I love the word fearless, but your comments made me giggle! Honestly, it's a powerful word. Maybe we can all try to be fearless together. I love this. I always want to write more but somehow have never considered it a priority enough to write every day. I'm not a writer of stories, but I just want to journal every day. Good luck on your journey. I'm sure it is going to be a great year for you! Michelle ... Thank you! So far, I have been writing almost every day, especially with the journaling. It's been better than it has been in a long time, if not ever. Hoping it will keep up! Excellent word...because I know you, at heart, are a writer. Good luck this year.